A partial vote count from Bosnia’s general election shows a Bosnian Serb nationalist leader is ahead in the race for the Serb seat in the country’s three-person presidency. Pro-Russian Serb leader Milorad Dodik has declared victory in the race to fill the Serb seat in Bosnia’s three-member presidency. Dodik said he won 56 percent of the vote in Sunday’s election and that his main opponent, Mladen Ivanic, won 44 percent. Dodik says his claim is a projection made with 85 percent of ballots counted and not expected to change significantly. Preliminary official results are expected later. The two main contenders for the Serb seat in Bosnia’s three-person presidency both say they are leading in the election for the post. The Bosnian Serb ruling coalition of President Milorad Dodik said Sunday that he was ahead of opposition candidate Mladen Ivanic, while the rival camp said the same. The two groups also had conflicting information about election results for main positions in Bosnia’s Serb-run entity. The claims were based on a partial vote count and could not be independently confirmed. Official results are expected later. Bosnia’s presidency also has a Muslim and a Croat member. Dodik is a pro-Russian nationalist who advocates separation of Serbs from the rest of Bosnia. Ivanic is considered to be more moderate. Election officials said more than half of 3.3 million voters cast ballots Sunday. Polls have closed in Bosnia, where a general election could decide whether the country remains locked in disputes from a brutal ethnic war or advances toward European Union and NATO membership. Some 3.3 million people were eligible to vote on Sunday for an array of institutions in Bosnia’s complex governing system, created by a peace accord that ended the 1992-95 war that killed 100,000 people. The country consists of a Serb-run and a Muslim-Croat entity with joint institutions in a central government. Voters cast ballots for the three-person Bosnian presidency, the Serb president, and the two entities’ parliaments and cantonal authorities. The campaign was marred by divisive rhetoric and allegations of irregularities. Bosnian election officials said several incidents were reported, but that they didn’t jeopardize the election. A nationalist Bosnian Croat candidate seeking re-election to Bosnia’s three-member presidency says he hopes the country’s election leads to equality for all ethnic groups. Bosnia consists of two regions with separate governing bodies, one Serb and the other Muslim-Croat. Covic has called for the creation for a third, Croat-only entity. He complains his ethnic group is outnumbered by Muslims in their joint region and thus not equally represented in the governing bodies. Moves by nationalist politicians to carve up Bosnia along ethnic lines sparked the 1992-95 war which killed 100,000 people and left millions homeless. A pro-unification Bosnian Croat candidate who wants Bosnia to rise above the ethnic partition from the war-era is challenging Covic. Liberal candidates for Bosnia’s three-person presidency have expressed optimism that voters will support pro-European candidates over nationalist leaders seeking to cement ethnic divisions from the country’s 1992-95 war. Opposition Social Democratic Party candidate Denis Becirovic said Sunday he expect voters to opt for a vision of Bosnia as country moving fast toward integration into the European Union and NATO. Becirovic describes himself as a “confident optimist” when it comes to his bid to win the Muslim seat in Bosnia’s three-person joint presidency. The body also has a Serb and a Croat member. The pro-Russian leader of Bosnia’s Serbs says he expects a “big victory” at Sunday’s election, which he said would be in the interests of the Serb mini-state in Bosnia. Milorad Dodik said Sunday if he is elected to the three-person Bosnian federal presidency that would pave the way for “important tasks” to be carried out for Republika Srpska, the Serb-run part of Bosnia. Dodik advocates more autonomy and an eventual separation of Serbs from Bosnia, which also has a Muslim-Croat regional government. The two regions were established in the peace accord that ended Bosnia’s bloody, divisive 1992-95 war. Sunday’s vote is for all levels of governance. Dodik, who must leave his position leading the Serb mini-state due to term limits, is a key Balkan ally of Russian President Vladimir Putin. His victory would mean stronger Russian influence in the divided Balkan nation. A Bosnian Serb opposition candidate for the three-person Bosnian presidency says he’s optimistic he will beat hard-line, pro-Russian Serb leader Milorad Dodik in Sunday’s election race. Ivanic is from the opposition Alliance for Victory group, made up of several opposition parties, which hopes to deal a blow to Dodik’s long-ruling coalition in the part of Bosnia governed by Serbs. Up for election are positions in both the Serb-dominated and Muslim-Croat regions. The complex network of institutions stems from the peace accord that ended Bosnia’s bloody 1992-95 war. A leading Muslim candidate for Bosnia’s three-person presidency says he is confident of a victory and expects the country to move forward after the election. Dzaferovic is from the Muslim Party of Democratic Action, or SDA. If he wins, Dzaferovic will replace the party leader Bakir Izetbegovic in the Bosnian presidency that also has a Serb and a Croat member. Some 3.3 million people are eligible to vote for an array of institutions in Bosnia’s complex governing system, which was created by a peace accord that ended the war that killed 100,000 people and left millions homeless. The country consists of a Serb regional government and a similar Muslim-Croat entity joined in a central government. 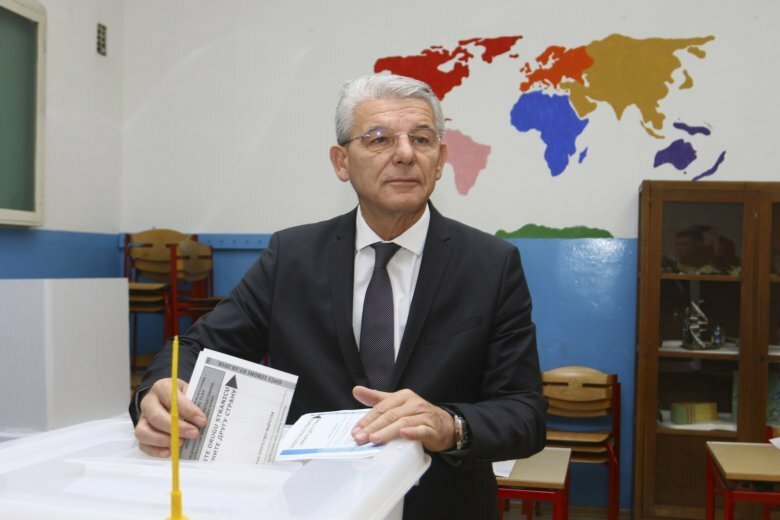 Voters are casting ballots for the three-person Bosnian presidency, the Serb president, and the two entities’ parliaments and cantonal authorities. The main focus is on the race for Bosnia’s three-member presidency, because of the candidacy of hard-line Serb President Milorad Dodik, who advocates eventual Serb separation from Bosnia. Dodik is a key Balkan ally of Russian President Vladimir Putin and his victory would mean stronger Russian influence.